Recently at an event where I was giving a continuing education presentation, I sat in on a presentation given by a manufacturer of wood framing materials. We usually talk in terms of dimensional framing (2×4 or 2×12) lumber as opposed to manufactured wood framing materials. 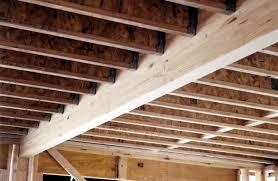 Today it is common practice to use manufactured wood products such as TJI’s (Truss Joist I-Beams–) These have become very common and popular because they are straight and flat while a 2 x 12 is a natural piece of wood that can warp and twist and then needs to be straightened out at the jobsite. Manufactured wood has gained in popularity because of these properties and others. However, in fires, manufactured wood burns differently than traditional dimensional framing products. This can be a problem because very often, at the homeowner’s request, builders will leave the basement unfinished for the homeowner to complete at a later time. What is happening is that in these scenarios, if there is a fire in the basement, firemen can fall through the unprotected floors because the exposed manufactured wood joists and beams may be burning faster than traditional framing materials. For that reason, a code change, Section 501.3 of the 2012 International Residential Code (IRC), has been developed mandating that all manufactured wood floor framing be covered by a 30 minute radiant barrier. That means that all those basements with unfinished ceilings will need to be finished. I strongly recommend that builders and contractors contact your building code officials to make sure you know what you are required to do to cover the exposed beams for safety. Installing and finishing a gypsum ceiling may be one of the most affordable and practical ways of providing our emergency responders with the protection they deserve. Have questions on whether your materials meet fire requirements? We can help. CertainTeed offers a wide-range of fire-rated products to put your mind at ease. Plus, air sealing strategies and it’s in the details, specifying the right finish the right walls.